We love Hoot Owl, and so I jumped at the chance to review Sean Taylor's release this month -- what with it clearly promising speech bubbles and comedy (and yes, I can confirm: it has both.) It also features narrator-character dialogue, colour- and font-coding for voices (and zero "he said/she saids"), fun exclamations, and a tight tie-in ending. 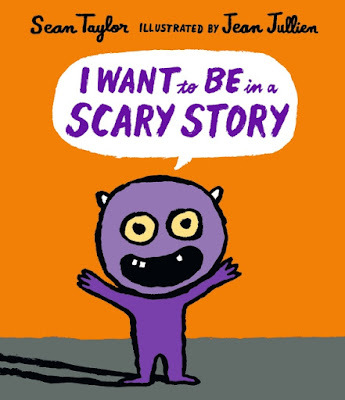 I am a big fan of books that take children to "scary places" in a fun way, and this is definitely one of those. The high contrast between the interludes and dark scenes pace the "scariness" so gently, even our youngest (age 4) didn't bat an eye. All of our girls love it, and it's one I'm happy to read again and again. The hardback edition would make a lovely gift...for your family library or someone else's. Review copy received from Walker.